The abdominal aorta is the largest blood vessel in the body. It is the main artery stemming from the heart. 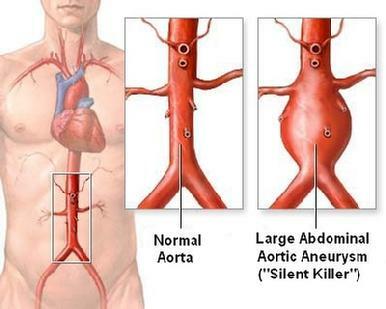 An abdominal aortic aneurysm (AAA) is an enlargement in the lining of that blood vessel. As the lining gets weaker, primarily due to age and other risk factors, the vessel wall becomes thinner and expands. Once discovered, an aneurysm is measured in diameter and is carefully monitored. When it grows beyond five (5) centimeters in diameter, the aneurysm is often surgically corrected. An aneurysm can rupture, producing catastrophic bleeding and results in a fatality 80% of the time. Most people with an abdominal aortic aneurysm present no warning signs. The most common location for an abdominal aortic aneurysm is below the area where the aorta divides to supply blood to the kidneys and above where it divides to supply blood to the pelvis and legs.